For Breakfast this morning I heated up the leftover Diced Potatoes and Diced Ham that I had prepared yesterday. Not a bad day out today, 54 degrees and mostly cloudy. After Lunch I took Mom’s car up to have it washed and then I cleaned all of the inside windows and vacuumed it out for her. Later on I entered a Scrabble Tournament online. I love Scrabble! For Dinner tonight I used the Leftovers from Thanksgiving. I prepared Baked Ham/Swiss and Turkey /Cheddar Sliders w/ Thanksgiving Side Leftovers. For Dinner its Baked Ham and Swiss Sliders along with Turkey and Vermont Cheddar Sliders. To make them I’ll need; King’s Hawaiian Sweet Rolls (Cut in half), leftover Ham, leftover Turkey Breast, Sargento Swiss Cheese, Boar’s Head Vermont Yellow Cheddar, Blue Bonnet Light Butter – 4 Tbsp (original recipe called for 8), 2 tsp. Dried Onion Powder, 1 1/2 tsp. Worchestershire Sauce, 1 1/2 tsp. Ken’s Light Poppyseed Dressing, and 1/2 tsp. French’s Yellow Mustard. Next I made my Bun Topping Sauce. I grabbed a medium size bowl to mix my ingredients in. I then mixed the Butter, Onion Powder, Worchestershire Sauce, Ken’s Light Poppyseed Dressing, and French’s Yellow Mustard together. Stirred until well mixed and sit it aside until ready to use it. Then to prepare the Sliders; preheat your oven to 350 degrees. Then I got an 11 x 14 baking pan that I lined with foil and sprayed with Pam Non-Stick Cooking Spray. I placed the bottom half of the Slider Buns in the bottom of the baking pan. Next I placed the Sweet Sliced Ham and Sliced Turkey Breast on top of each Bun. You can put as much of the Ham or Turkey you want on each. I then placed a 1/2 a slice of the Swiss on the Ham and Cheddar cheese on top of the Turkey. Then added the the top 1/2 of each bun to each Slider. Then topped all the Sliders with Topping Sauce Mixture. Covered the baking pan with foil and baked at 350 degrees for 15 minutes. Removed the foil and baked an additional 15 minutes to allow the rolls to crisp. Remove from oven to cool and serve. These Baked Ham Sliders are incredible! The Ham, Turkey, Cheese, and Buns are all great but the Topping Sauce makes the Dish. The Sauce gives it such great flavor, love these Sliders! Plus a great way to use those Thanksgiving Leftovers! Then I also heated the leftover Mashed Potatoes and Green Beans. Those Canned Green Beans are so delicious! We had canned these during Summer and broke out the first jar for Thanksgiving, so good! For Dessert later a Jello Sugar Free Dark Chocolate Pudding. The other day at Meijer I bought a Kentucky Legend Hickory Smoked Ham, along with our Turkey for Thanksgiving. It was a small 4 lb. Ham, and it looked delicious as always! I’ve baked a couple of these now and really enjoy them. Having it for Dinner tonight! To prepare it; Preheat oven to 350 degrees Fahrenheit. Remove the Kentucky Legend ham from the packaging and place it in a baking dish that’s at least 2 inches deep. Add enough water to just cover the bottom of the pan. Cover the baking dish with aluminum foil. Crimp the edges of the foil tightly over the pan edges to prevent steam from escaping. Place the baking dish into the oven and heat the ham until a meat thermometer shows an internal temperature of at least 140 degrees Fahrenheit. The amount of time this takes depends on the size and shape of the ham. Mine took 80 minutes. When the Ham is heated through, remove the baking pan from the oven. Leave the foil on the pan for 15 minutes to rest the meat before removing it and carving. I then began slicing it, I sliced it somewhat thin. I’m using Aunt Millie’s Light Whole Grain Bread and I’ll need Woeber’s Horseradish Mustard, Boar’s Head Imported Switzerland Swiss Cheese. I assembled my Sandwich, Ham, French’s Spicy Brown Mustard, served on Aunt Millie’s Light Whole Grain Bread. What a Sandwich! The Ham is delicious and moist. Excellent Ham Sandwich! Mom thought it was one of the best tasting Hams she ever had, and I agree! We had plenty of leftovers. Kept some out for Breakfast and froze another bag. I didn’t make any side dishes to go with the Sandwich, still not much of an appetite of late. For Dessert later a Jello Sugar Free Dark Chocolate Pudding. Get the legendary taste of Kentucky Legend Ham in a convenient sliced quarter size. Seasoned and cured to perfection, our double-smoked ham is perfect for sandwiches, appetizers or main courses. Make your everyday meals and snacks easy and delicious! Ingredients: Cured With Water, Brown Sugar, Contains 2% Of Salt, Sodium Lactate, Dextrose, Sodium Phosphate, Sodium Diacetate, Sodium Erythorbate, Sodium Nitrite. Made in Switzerland with Alpine milk under the watchful eye of Käse Meisters, this cheese has a nutty, slightly sweet flavor with earthy notes. Boar’s Head Imported Switzerland Swiss Cheese is aged more than 120 days to produce a bold taste, rich color and smooth texture. For Breakfast this morning I made some Simply Potatoes Shredded Hash Browns, heated up some Meijer Diced Ham,and made a cup of Bigelow Decaf Green Tea. I made a bed of the Hashbrowns in a bowl and sprinkled some Sargento Reduced Fat Sharp Cheddar Cheese. Next I put the Diced Ham over top the Hash Browns and served.And had my morning cup of Bigelow Decaf Green Tea. Partly sunny and a bit more humid outside today. I took Mom’s car up to be washed then stopped by the ATM, the Post Office, and stopped and got gas. Back home, kicked back the rest of the afternoon. For Dinner tonight I prepared a Hickory Smoked Ham and Swiss Cheese Sandwich w/ Baked Fingerling Potato Wedges and Green Beans. The other day at Meijer I bought a Kentucky Legend Hickory Smoked Ham. It was a small 2 1/2 lb. Ham, and it looked delicious as always! I’ve baked a couple of these now and really enjoy them. Having it for Dinner tonight. To prepare it; Preheat oven to 350 degrees Fahrenheit. Remove the Kentucky Legend ham from the packaging and place it in a baking dish that’s at least 2 inches deep. Add enough water to just cover the bottom of the pan. Cover the baking dish with aluminum foil. Crimp the edges of the foil tightly over the pan edges to prevent steam from escaping. Place the baking dish into the oven and heat the ham until a meat thermometer shows an internal temperature of at least 140 degrees Fahrenheit. The amount of time this takes depends on the size and shape of the ham. Mine took 80minutes. When the Ham is heated through, remove the baking pan from the oven. Leave the foil on the pan for 15 minutes to rest the meat before removing it and carving. I then began slicing it, I sliced it somewhat thin. I’m using Aunt Millie’s Light Whole Grain Bread and I’ll need Boar’s Head Imported Switzerland Swiss Cheese. I assembled my Sandwich, Ham, French’s Spicy Brown Mustard, served on Aunt Millie’s Light Whole Grain Bread. What a Sandwich! The Ham is delicious and moist. Excellent Ham Sandwich! Mom thought it was one of the best tasting Hams she ever had, and I agree! We had plenty of leftovers. Kept some out for Breakfast and froze another bag. For a side I prepared some more of the Roasted Fingerling Potatoes. Started by washing the Potatoes off in cold water. I then cut the Fingerling Potatoes in half, lengthwise. Put the Potatoes in a large bowl seasoned them with; Extra Virgin Olive Oil, Garlic Powder, Sea Salt, Pepper, Chili Powder, and Kraft Reduced Fat Parmesan Grated Cheese to top the Potatoes with. Using a cookie sheet lined with foil I spread the Potatoes out on the sheet . Then Roasted them at 400 degrees until they were fork tender, about 20 minutes. Still can’t figure out why it’s so hard to find Fingerling Potatoes in this area. Still only 1 store around here locally that sells them, so thank you Jungle Jim’s! I also heated up some leftover Green Beans. These are the fresh Green Beans we had purchased from Jungle Jim’s Still delicious! Quite a Dinner tonight. For Dessert/Snack later a bowl of Skinny Pop – Pop Corn and a Coke Zero to drink. For Breakfast this morning I made a Breakfast Sandwich using; a toasted Healthy Life Whole Grain English Muffin, lightly fried an al fresco Country Style Chicken Sausage Breakfast Patty, And had a cup of Bigelow Decaf Green Tea. After Breakfast I went to Menard’s to pick up a small can of Black Paint and then to Kroger and picked up a couple of Donuts for Mom, she wanted Coffee and Donuts for her Breakfast. I needed the paint to touch up the trim of the shed and to touch up a couple of the shutters around the house. A bit hotter and more humid today, 88 degrees and sunny. For Dinner tonight I prepared a Skillet Potatoes and Ham with a Sunny Side Up Egg. The 2nd day of Breakfast for Dinner tonight. Skillet Potatoes and Ham for Breakfast, I mean Dinner! I’ll need; 1 package of Simply Potatoes Steakhouse Seasoned Diced Potatoes, a package of Meijer Diced Ham, 1 Egg, Morton’s Lite Salt, Ground Black Pepper, Sargento Reduced Fat Shredded Sharp Cheddar Cheese, Pam Non Stick Cooking Spray, and Extra Light Olive Oil. To start I got a large skillet and sprayed it with Pam and added 2 tablespoons of Extra Light Olive Oil, heated it on medium heat. When the skillet was ready I added the package of the Simply Potatoes Steakhouse Seasoned Diced Potatoes. I lightly seasoned them with the Salt and stirred. Put the lid on the skillet and let them cook. Using a spatula, I turned them several times so they would cook evenly. Cooked a total of 15 minutes. With about 3 minutes of cooking time left I added the package of Meijer Diced Ham. Stirred and finished the cooking of the Potatoes. When done put them in a large bowl and set it aside. As the Potatoes and Ham were finishing I got a small skillet sprayed it with Pam and added a 1/2 tablespoon of Extra Light Olive Oil, heated it on medium heat. When the skillet was heated I added the Egg. Seasoned it with Salt and Pepper. I grabbed a teaspoon and scooped up some of the Olive Oil and poured it on top of the Yolk. Then put a lid over the skillet and cooked my Egg. Sunny Side Eggs always cook better with a lid over the skillet and a bit of the Oil over them when cooking them. It gives the Yolk a good finish. To put the dish together I used a bowl and made a bed of the Potatoes and Ham, seasoned them with a little of the Salt. Sprinkled some Sargento Reduced Fat Shredded Sharp Cheddar Cheese on top and then added the Sunny Side Egg. Time to Eat! I love the combo of Potatoes and Ham! Then with Egg topping it off it gave great flavor and tied the dish together. Excellent Dinner tonight. For Dessert/Snack later a bowl of Skinny Pop – Pop Corn with a Diet Tropa – Rock – A Snapple to drink. Simply Potatoes Steakhouse Seasoned Diced Potatoes. Made from only real, fresh, never frozen potatoes that are as deliciously easy as they are wholesome. Free from gluten. Simply Potatoes Steakhouse Seasoned Diced Potatoes. * Made from fresh potatoes. * Net Wt 20 oz (1 lb 4 oz) 567 g.
Ingredients: Potatoes, Dextrose, Steakhouse Seasoning (Dehydrated Vegetables [Garlic, Red Bell Peppers and Onion], Salt, Spice, Natural Flavors, Oleoresin Paprika, and Silicon Dioxide Added to Prevent Caking), Contains 1/2% or less of the following: Disodium Pyrophosphate (Added to Maintain Color), Potassium Sorbate and Sodium Bisulfite (Added to Maintain Freshness). Instructions: Keep refrigerated.Cook before serving.For best quality and cooking results, do not freeze.After opening, store in an airtight container and use within 3 days.Simple Steps to Delicious Potatoes:Heat 2 tbsp of vegetable oil in a skillet over medium heat.Add potatoes. Cover with lid.Cook 12-15 minutes, turning every 3-4 minutes.Note: During cooking, potatoes must reach a temperature of 165F for 2 minutes. Do not eat until fully cooked. Eggs are a very good source of inexpensive, high quality protein. More than half the protein of an egg is found in the egg white along with vitamin B2 and lower amounts of fat and cholesterol than the yolk. The whites are rich sources of selenium, vitamin D, B6, B12 and minerals such as zinc, iron and copper. For Breakfast this Morning I had a cup of Bigelow Decaf Green Tea. At 10:30 this morning we had to be over at the office of where Dad is staying. We are applying for Medicade for Dad. They seem to want everything you have but your first-born children. Hope we get it worked out, very stressful! Rain showers this morning and very windy. There’s a lot of flooding all over the area, even had a Tornado watch last night. Very windy and a of 40 today, but the wind chill made it about 30. For Dinner tonight I wanted some Breakfast! So Breakfast it is, I prepared Ham, Eggs, Hash Browns, and Toast. Breakfast for Dinner sounded perfect for Dinner tonight! I sliced up the rest of our Ham off the bone, I had prepared the Ham the day before. The Ham is so moist and delicious! We used Cook’s Bone In Ham. To prepare it I used a small skillet, sprayed it with Pam Cooking Spray, and heated it on medium heat. I then took a few slices of it and reheated it i tin the skillet for about 5 minutes. I love this Ham! It has such good flavor, perfect for Breakfast or Dinner. Next I used the same skillet and I prepared a Sunny Side Up Egg. Fried it on medium low, seasoned with Morton’s Lite Salt and Ground Black Pepper. As the the Ham and Egg were cooking, in another skillet I prepared some Simply Potatoes Shredded Hash Browns. I love these, I could have them every day! Again I used a small skillet, sprayed it with Pam Cooking Spray, added 1 tablespoon of Extra Light Olive Oil, and heated it on medium heat. I fried these for 14 minutes. When done I sprinkled some Sargento Reduced Fat Shredded Sharp Cheddar Cheese. Finally I toasted a couple of slices of Aunt Millie’s Light Whole Grain Bread. Topped them with some I Can’t Believe It’s Not Butter. Had a glass of 2% White Milk to drink. I had one hearty Comfort Food Dinner tonight! For Dessert/Snack later a bowl of Skinny Pop – Pop Corn and a Diet Dr. Pepper to drink. Simply Potatoes Shredded Hash Browns fry up perfectly to a crisp, golden brown because they’re made from quality potatoes. They’re always fresh, never frozen so you’ll never have to worry about freezer burn. Fresh, delicious potatoes mean you never have to sacrifice great homemade taste. For Breakfast this I toasted a Healthy Life Whole Grain Muffin and topped it with Smucker’s Sugarless Blackberry Jam, Love that Jam. I also had my morning cup of Bigelow Decaf Green Tea. Well Winter just will not go away! Overnight a snow system moved through and gave us over an inch of snow. It melted pretty quick though as we had a of 52 degrees for the day. After Breakfast I went up to Kroger, they had Hams on sale and Bought a Cook’s Semi-Boneless Ham. It was close to 7 3/4 lbs. and got it for $6.21. We usually have a Ham for Easter but went to Easter Dinner at a Family member. I love a good baked Ham and to me the leftovers are the best part! Ham Sandwiches like tonight and fried Ham for Breakfast. Dad is doing a lot better today, he’s getting to know everyone and adjusting to it. We sure do miss him here at home! For Dinner tonight I prepared a Ham Sandwich w/ Applewood Smoked Bacon Potato Casserole. We almost always use Cook’s Ham when we bake a Ham. So with the Ham I baked earlier, we made some into Ham Sandwiches. Just took a few slices and serving it on Aunt Millie’s Light Whole Grain Bread. The Ham is so delicious and moist. And as always with Cook’s Ham, perfect seasoning! We’ll have quite a few Breakfasts and Lunches out of this. I served the Ham on Aunt Millie’s Light Whole Grain Bread. I was going to add Mayo or Mustard but I just wanted the taste of that delicious Ham! To go with the Ham I prepared a box of Idahoan Applewood Smoked Bacon Homestyle Casserole. Like the other Idahoan dishes their a breeze to prepare and a delicious Potato Dish. And like the others this turned out fantastic! Very well seasoned, and you can taste that Applewood bacon flavor. I love my Potatoes! For Dessert/Snack later a bowl of Skinny Pop – Pop Corn with a Coke Zero to drink. Cook’s Semi-Boneless Hams are now fully cooked! This means they may be eaten cold or heated. The ham only needs to be heated through if serving warm. With fewer bones and less fat, Cook’s Semi-Boneless Hams are a great value. With two of the three bones removed, carving and serving are much easier. With only the center bone remaining, your family can still can enjoy the great taste and flavor that only a Cook’s bone-in ham can offer, plus the added value of more lean meat and the convenience of less bone. CURED WITH: Water, Dextrose, Salt, Sodium Phosphate, Sodium Nitrite. The saying is “everything is better with bacon” and we couldn’t agree more. That’s why we incorporated Applewood Smoked Bacon in with our rich cheesy sauce for this homestyle casserole that is sure to become a family favorite. 1 – Preheat oven* to 450°F. Combine potatoes and sauce mix in 1 1/2-quart baking dish. 2 – Stir in 2 cups boiling water, 3/4 cup milk, and 2 Tbsp. butter or margarine with whisk. 3 – Bake uncovered for 25 minutes or until top is golden brown and potatoes are tender. Remove from oven and let stand a few minutes before serving (sauce will thicken slightly when cooling). For Breakfast this morning I made some Simply Potatoes Shredded Hash Browns, Heated up some Meijer Diced Ham, fried an Egg Sunnyside Up, made a cup of Bigelow Decaf Green Tea. I made a bed of the Hashbrowns in a bow and sprinkled some Sargento Reduced Fat Sharp Cheddar Cheese. Next I put the Diced Ham over top the Hash Browns then put the Sunnyside Up Egg on to top it off. Started the day below zero again at minus 3. We only had a high of 15 degrees. After Lunch went to bank and post office and back home. Very cold out but it feels good to get out of the house! For Dinner tonight I prepared a Grilled Ham and Swiss on Sour Dough Bread w/ Baked Fries. To prepare the Sandwiches I’ll need; Boar’s Head Sweet Slice Ham, Sargento Reduced Fat Swiss Cheese, French’s Yellow Mustard, Kraft Reduced Fat Mayo w/ Olive Oil, and Goldminer California Sourdough Bread. I used the flat top Griddle to grill it with. I sprayed the griddle with a very light coat of Pam Cooking Spray and spread about 1/2 tablespoon of Blue Bonnet Light Butter on it. Heated it on medium heat. I also turned the oven on at 425 degrees, for the Fries. While the griddle was heating I got the Sandwich ready to grill. Took a slice of the Sour Dough Bread and topped it with some of the Kraft Mayo, the Boar’s Head Ham, the Sargento Swiss, French’s Mustard, and added the top slice of the Sour Dough Bread. I then Buttered the bottom and top halves of the Bread with Blue Bonnet Butter. With the griddle heated I grilled my Sandwich. Grilled the bottom half just over 3 minutes, then flipped it over and grilled the other side about 2 1/2 minutes. Until both sides were golden brown! What a Sandwich, Sour Dough Bread just makes everything that much better! I had already preheated the oven, so as the griddle was heating I baked my Fries, I’m using Alexia Organic Yukon Select Fries. Seasoned them with McCormick Grinder Sea Salt and Black Peppercorn Medley. Baked them at 425 degrees for 16 minutes. They bake up beautifully and seasoned just right, excellent Shoestring Fry! Plus they are only 120 calories and 15 net carbs. It’s an easy prepared but hot and filling meal. For Dessert/Snack later a bowl of Skinny Pop – Pop Corn and a Diet Peach Snapple to drink. Enjoy the exceptional flavor of a traditional bone-in ham without the bone. Available in the Deli retail case as a center of the plate item or at the Service Deli sliced by the pound for a sandwich of note. Take your sandwich or favorite toast to the next level or use our squares as the base of breakfast casseroles or get crafty and try your hand at sandwich sushi! RIBOFLAVIN, FOLIC ACID), WATER, SALT, YEAST. CONTAINS: WHEAT. MAY CONTAIN SOYBEAN, EGGS AND TREE NUTS. For Breakfast this Morning I toasted a Healthy Life Whole Grain English Muffin that I topped with Smucker’s Sugar Free Blackberry Jam. Also had that morning cup of Bigelow Decaf Green Tea. This morning it was cloudy and 28 degrees. As the day went on we seen some sunshine and a high of 51 degrees. Did a few things around the house and then starting at Noon I watched College Football for the rest of the afternoon. For Dinner tonight some Breakfast! I prepared Ham, Eggs, Hash Browns, and Toast. Breakfast for Dinner sounded perfect for Dinner tonight! I sliced up the rest of our Thanksgiving Ham off the bone. The Ham, as it is most years, was moist and delicious! We used Cook’s Bone In Ham. To prepare it I used a small skillet, sprayed it with Pam Cooking Spray, and heated it on medium heat. I then took a few slices of it and reheated it i tin the skillet for about 5 minutes. I love this Ham! It has such good flavor, perfect for Breakfast or Dinner. Finally I toasted a couple of slices of Aunt Millie’s Light Whole Grain Bread. Topped them with some I Can’t Believe It’s Not Butter. Had a glass of 2% White Milk to drink. For Dessert/Snack later a bowl of Skinny Pop – Pop Corn and a Coke Zero to drink. *The SmartPoints® value for this product was calculated by Aunt Millie’s and is provided for informational purposes only. This is not an endorsement, sponsorship or approval of this product or its manufacturer by Weight Watchers International, Inc., the owner of the Weight Watchers® and SmartPoints® trademarks. This bread has fewer calories than regular bread and provides at lease 20% of the recommended grams of fiber health experts suggest. We had to call 911 and have Dad taken back to the Hospital. He was so weak he couldn’t even get up from chair. It looks as though they are going to keep him there for 1-2 days and then move him to a Rehab and Assisted Living Center to see if they can build his strength back up, hopefully it’s not a permanent move. So its been a very long day for all of us. I picked up a Salad at the Hospital Cafeteria for a late Lunch. I returned home about 5:00 this afternoon. Too tired to cook! I just made a Ham Sandwich with a few Potato Chips for Dinner. I used Boar’s Head Sweet Sliced Ham, Sargento Reduced Fat Swiss Cheese, French’s Yellow Mustard, Kroger Bakery Sour Dough Bread, Ruffle’s Reduced Fat Potato Chips, Helluva French Onion Dip. Not a bad last-minute Dinner! Kitchen will reopen tomorrow! Mom wanted to go to Jungle Jim’s International Market so this morning after i prepared us Breakfast that’s where we went. I love shopping at Jungle Jim’s! There’s always some different items every time you shop here. I picked up some Deli Meats and Cheese, Polenta, and some Seafood. Back home finished up some laundry for Mom and went to the rehab center to see Dad for a while. They told us at rehab that they tested his memory and he’s lost about 50% of his memory. Only going to get worse with dementia. 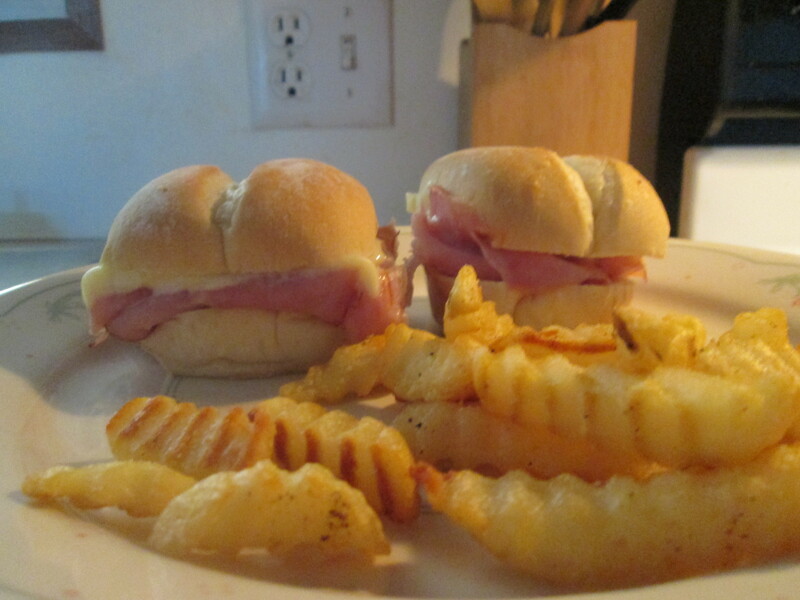 For dinner tonight Arby’s Ham and Cheese Sliders and Baked Crinkle Fries. Another one of those days where I had dinner planned out and it just didn’t work out. I was at the rehab with Dad longer than I thought I was going to be and when I left to come home I just didn’t feel like cooking. 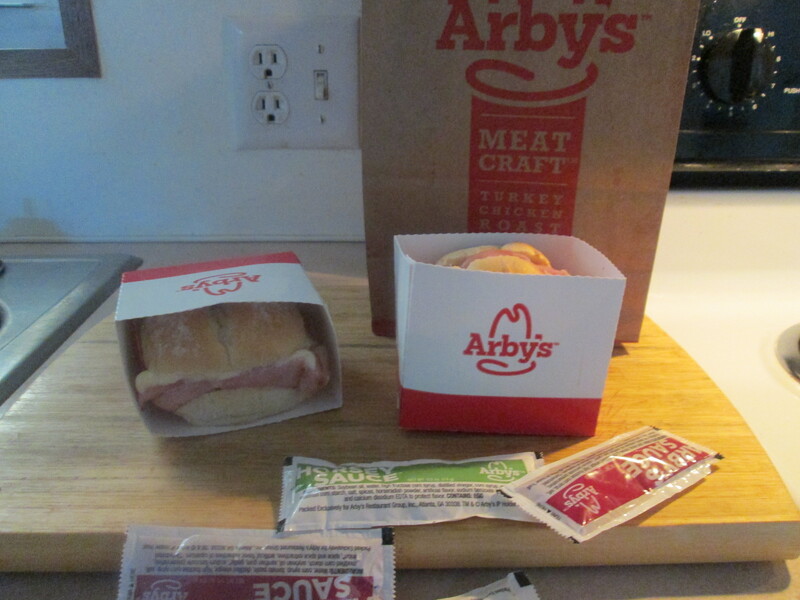 So I had heard that Arby’s Sliders were very good so I stopped there and picked up 2 of the Ham and Cheese Sliders. I opted to go with the Ham Slider over the Roast Beef, fewer calories. First time I tried these and really like them! Fantastic Slider Bun and excellent Ham. 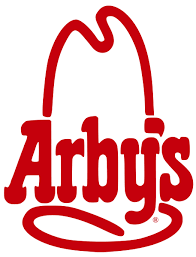 I’ve always loved the Arby’s Ham sandwiches, just don’t eat out often. Then I baked some Ore Ida Crinkle Fries. These have a lot fewer calories, carbs, and fat than Arby’s or any take-out Fries. I had a side of Hunt’s Ketchup for dipping also. For dessert later a Healthy Choice Dark Fudge Swirl Frozen Greek Yogurt. ​​Thinly sliced ham and melted cheese on a soft slider roll. So you can have a little ham on the side, or 10 of them on their own. Up to you.